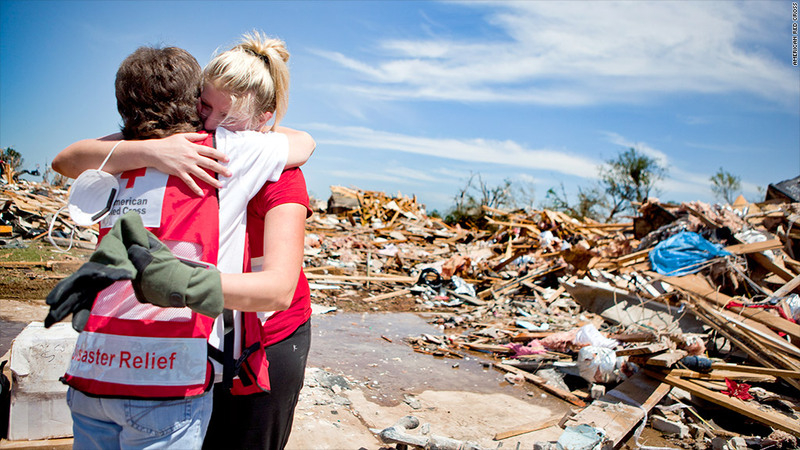 The Red Cross has received $15 million in donations and pledges for Oklahoma. Millions of dollars are being raised in the wake of the deadly Oklahoma tornado. The Red Cross has received more than $15 million in donations and pledges so far for the town of Moore, which was struck by a tornado Monday that killed 24, injured more than 300 and destroyed thousands of homes. With the money raised, the organization has opened 10 emergency aid stations, provided shelters for victims, served more than 16,000 meals and snacks and given out more than 3,000 relief items like shovels, toiletries and trash bags. The Salvation Army has raised another $4.3 million, and donations made to individual victims or nonprofits via crowdfunding websites now exceed $1 million. Other aid organizations, including AmeriCares and Feeding America are also collecting donations for victims. Big businesses are making some of the largest donations. Companies including Lowe's (LOW), Walmart (WMT), Continental Resources (CLR) and ConocoPhillips (COP) have each given or pledged $1 million or more to the Red Cross and other organizations. Overall, businesses have donated $24 million, according to the Chamber of Commerce Foundation's Business Civic Leadership Center. And some companies are donating more than cash. In addition to contributing $1 million, Chesapeake Energy (CHK), for example, is using some of its oil-drilling equipment to assist with the clean-up efforts, and it provided generator-powered flood lights and truckloads of leather gloves, hard hats and safety glasses for rescue and recovery efforts. As the generous donations continue to pour in, Oklahoma needs all the help it can get. The series of tornadoes that swept across the Midwest between May 18 and May 20 -- the most powerful of which touched down in Oklahoma -- caused between $2 billion and $5 billion in structural damage, according to an estimate from catastrophe risk modeler Eqecat. And that doesn't even include the medical costs that many families are facing as a result of the storm. So far, monetary donations trail the amounts raised after Superstorm Sandy, which devastated much of the nation's east coast. Only a couple days after Sandy hit, the Red Cross had already raised nearly $35 million. To date, the Red Cross has brought in $302 million for Sandy relief. Visit CNN's Impact Your World for information about the best ways to help.